A Texas woman has filed a products liability lawsuit against Advanced Medical Optics Inc. for its contact lens disinfectant Complete Moisture Plus Multi-Purpose solution’s failure to properly disinfect her contact lenses. Kimlyn Cline, a contact lense wearer for 35 years, says she always cleans and disinfects her contact lenses properly and that the infection in her left eye occurred because she used the solution. The damages she is seeking include medical costs, loss of income, pain, vision problems, mental and emotional trauma, disfigurement, and legal fees. A corneal specialist diagnosed Cline’s condition as Acanthamoeba Keratitis. She must now undergo corneal transplant surgery, but she cannot do this until her infection clears. In her defective products lawsuit, Cline claims that the risk of infection from using Complete Moisture Plus Multi-Purpose solution is grossly disproportionate to the risks associated with using other solutions. She says that Advanced Medical Optical should have acted to reduce or eliminate these higher risks. Cline alleges that the company was aware the solution was defective but still designed, manufactured, marketed, and sold its lens solution to wearers without including a failure to warn of the risk of infection or providing proper instructions for use. Grounds for the lawsuit include strict liability involving design, manufacturing, and marketing, negligence, and breach of implied warranties. 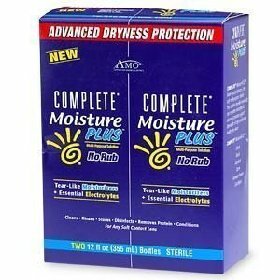 In November 2006, Advanced Medical Optical recalled 18 lots of Complete Moisture Plus Multi-Purpose solution and then announced a full recall of the product line last May after the Center for Disease Control and Prevention found that the solution was a high risk for causing eye infections. Acanthamoeba Keratitis is a rare eye condition that occurs primarily in contact lens users. Failure to treat the infection can lead to vision loss and severe scarring.